Lace up your walking shoes and go beyond the scenic overlook to discover the wild side of one of the Caribbean's greenest islands. Saint Lucia is an island of stentorian-clad mountains, rushing jungle streams and diaphanous waterfalls. It's also home to another-world landscape of geothermal activity, where volcanic vents spew clouds of sulfurous gas and mineral-rich mud bubbles from the ground. Adventure awaits for those who explore by foot. Climb to the summit of a world-famous landmark, soak in a hot spring that was once a favorite of an empress, or search for endemic birds deep in a mountain valley. More than three-quarters of Saint Lucia remains covered in forests, with substantial portions of the land protected within national parks and nature preserves. Miles of hiking trails give access to sites ranging from remote beaches to mountain ridges and volcanic valleys. Many sites are best reached by guided walks. You'll definitely want a guide if you plan to climb to the top of Gros Piton. If you can't decide between walking or swimming, do both by booking a day cruise on a sailing catamaran. A cruise down the coast brings you past the landmark pitons to the town of Soufriere for hikes to hot springs and botanical gardens. There's also still plenty of time for swimming and touring Marigot Bay, which is one of the most beautiful coves in the Caribbean. At Soufriere Volcano, you can walk into an alien landscape of bubbling mud pools and odoriferous sulfur hot springs. The shaded pathways of Diamond Botanical Gardens lead to one of the most colorful waterfalls in the Caribbean. A hike up the Gros Piton Nature Trail will reward with panoramic views of island and ocean. The trail through the Millet Bird Sanctuary leads to a ridge top overlook where Saint Lucian parrots and other endemic bird species roost. Hiking boots aren't a must, but some type of lace-up shoes with sturdy soles is needed for most trails. Shorts and a moisture-wicking shirt will provide comfort on longer walks, and you might want to pick up a walking stick for the climbs. Remember a small backpack for towels, snacks, bug spray water and a camera or smartphone. GROS INLET - CARADONNA RECOMMENDS includes 7 night Ocean View accommodations, daily breakfast, Adrena Line Zip Line Adventure, ATV Adventure, Gros Piton Nature Trail Hike, Cycling Adventure, complimentary 30-minute body exfoliation at the The Spa at Windjammer Landing, free WiFi, roundtrip airport transfers, hotel tax and service charges. Valid 8/19/19-10/10/19. Book by 4/6/19. Additional dates available at varying rates. ANSE COCHON - 7-NIGHT DIVE PACKAGE includes 7 nights Ocean View accommodations, 5 days of 2-tank boat dives, welcome drink, breakdast, lunch and dinner daily, complimentary use of paddle boards and kayaks, Managers cocktail party, roundtrip airport transfers, hotel tax and service charges. MARIGOT BAY - BUILD YOUR OWN PACKAGE includes 7 nights firefly studio accommodations, free WiFi, roundtrip airport transfers, hotel tax and service charges. Options to add-on Island Tours, Whale Watching Tours, Offroading Adventure and Hiking Tour of the Grand Piton. GROS INLET - BUILD YOUR OWN PACKAGE includes 7 night Ocean View accommodations, free WiFi, roundtrip airport transfers, hotel tax and service charges. Options to add-on Snorkel Tours, Island Tours, Whale Watching Tours, Zip Line Adventure, Offroading Adventure and Hiking Tour of the Grand Piton. SOUFRIERE - AMAZING ADVENTURE PACKAGE includes 7 nights superior accommodations, welcome drink, fruit basket and drink package, breakfast, lunch and dinner daily and afternoon tea, scuba diving for certified divers or one scuba beginner resort course including two dives for non-certified divers; jungle biking; boat snorkel trips; guided walks and hikes on ANSE CHASTANET's 600-acre estate; and one Rain Forest Hike. Exchange a day of scuba diving or Jungle Biking for a "Kool Kayaking" coastal adventure, daily resort yoga class with options to add-on specialty yoga activities, use of non-motorized watersports, roundtrip airport transfers, hotel tax and service charges. SOUFRIERE - TOTAL ROMANCE PACKAGE includes 7 nights superior accommodations, welcome drink, fruit basket and drink package, breakfast, lunch and dinner daily and afternoon tea, most alcoholic and non-alcoholic beverages, bottle of French champagne, tour of Volcano, Sulphur Springs, and Diamond Mineral Baths, escorted walk of the Old French Colonial Plantation, guided boat snorkel trip, a resort scuba diving course for beginners or 2 dives per person for certified divers, a one-hour Swedish Massage per person, half-day Jungle Biking in Anse Mamin Valley, half-day sailing on skippered resort yacht Searenity, and 2 Anse Chastanet T-shirts, daily resort yoga class with options to add-on specialty yoga activities, use of non-motorized watersports, $500 anniversary return certificate, roundtrip airport transfers, hotel tax and service charges. ANSE COCHON - BUILD YOUR OWN PACKAGE includes 7 night Ocean View Room accommodations, breakfast daily, complimentary use of kayaks and paddle boards, free WiFi, roundtrip airport transfers, hotel tax and service charges. Options to add-on Island Tours, Zip Line Adventure, and Hiking Tour of the Grand Piton. 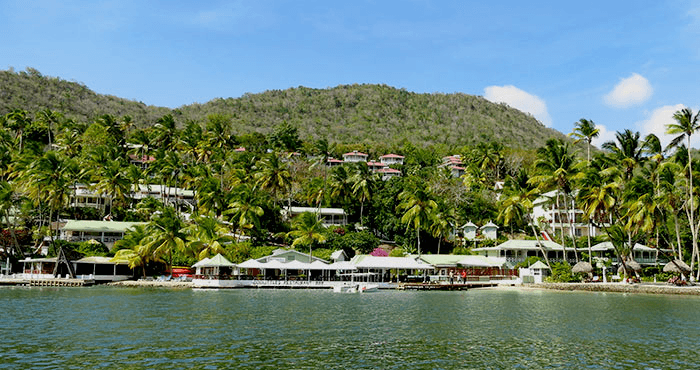 MARIGOT BAY - Uniquely situated in a stunning and secluded part of St Lucia that's only accessible by boat, Marigot Beach Club and Dive Resort is nestled in lush tropical rainforest overlooking one of the most beautiful and exotic bays in the world. From the veranda of your studio or villa you'll enjoy spectacular St Lucian sunsets, and within a few steps you'll be on our palm-fringed white sand beach, sipping exotic cocktails from Doolittle's Restaurant and Bar. 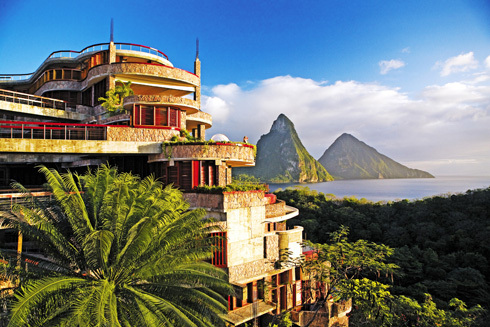 SOUFRIERE - Rising majestically above the 600 acre beach front resort of Anse Chastanet, Jade Mountain Resort on St. Lucia’s south-western Caribbean coastline is a cornucopia of organic architecture celebrating St. Lucia’s stunning scenic beauty. Expect grand sweeping spaces where bedroom, living area and an extravagant private infinity pool glide into one another to form extraordinary platforms floating out into nature. With the fourth wall entirely absent, Jade Mountain’s sanctuaries are stage-like settings from which to embrace the full glory of St. Lucia’s Pitons World Heritage Site, and of course, the eternal Caribbean Sea. SOUFRIERE - A spectacular scenic hideaway on a 600-acre tropical estate with two beaches bordering pristine coral reefs, this resort features 49 rooms in a unique hillside/beachside setting, two restaurants/bars, boutiques, art gallery, 42’ day sailing yacht and a full-service spa. 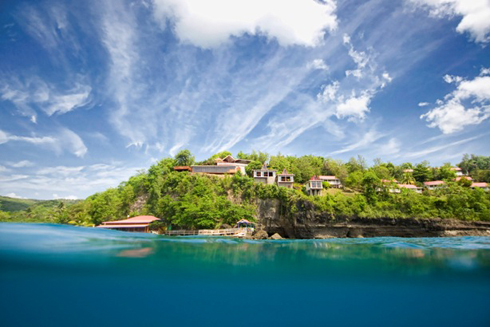 ANSE COCHON - Nestled on the cliffside in one of the best snorkeling and shore diving bays in St.Lucia, Anse Cochon cove. In 2012 it was one of the top resorts in St. Lucia for romance and with only 33 rooms (14 adjoining, 19 private and 11 of those with private plunge pools), is one of the ultimate place to relax in luxury cottages with beautiful views and sunsets across the Caribbean sea, amazing personable staff, unbelievable spa treatments in our Kai Koko Spa. GROS INLET- From the friendly and approachable staff, to the white sand along the Caribbean Sea, to the hillside Villas offering stunning views of the ocean. Windjammer Landing is ideal for your next dive vacation. An independent, one-of-a-kind resort, once you experience the personal touch at Windjammer Landing, you’ll never want to leave. U.S. citizens need a valid passport that must be valid 6 months beyond the date of entry into Saint Lucia, with available space for entry stamp. No visa is required with proof of onward or return ticket and accommodation confirmation. Check the entry/exit requirements here. A departure tax of $68EC, approx $25.30 should be included in your international airline ticket. Vaccinations are not required for entering the Caribbean if you're coming from the United States. Before traveling check with the CDC here. 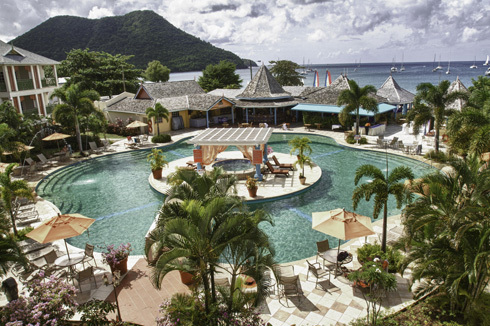 Saint Lucia is a land of vibrant greens set in a sapphire sea. Rainforests cover the island's interior, providing vacationers with a variety of eco-adventures that range from sedate birding hikes and relaxing rides on an aerial tram to off-road adventures and soaring zip line flights through forested canopies home to endemic birds such as the Saint Lucia parrot. The lush surroundings also set the stage for a number of unique resort properties that blend luxury and nature, and provide some of the best dining experiences in the Caribbean. The island's rich volcanic soil yields a cornucopia of tropical fruits and vegetables. This bounty is reflected in the savory dishes of traditional Creole cooking, and it has inspired a new wave of organic and fusion cuisines that have earned island chef's top honors in international culinary competitions. In addition to enlivening resort kitchens, Saint Lucia's farms and orchards support a thriving agricultural export sector that includes bananas and chocolate. One of the island's sweetest day trips involves a tour of historic cacao plantations, followed by a chance to create your own chocolate confections. Across the island English influences are obvious, but so too are the cultural contributions of France and Africa. The local version of relaxing is known as “going on the lime” or “liming,” which simply involves stopping by a favorite local pub or rum shop and spending time with friends. Saint Lucia runs on 220 to 230-volt AC (50 cycles), so bring an adapter if you plan to use U.S. appliances. Some hotels are wired for U.S. appliances. Check with your local provider to see what plans are available, otherwise, you will be subject to roaming charges. The country/area code for Saint Lucia is 758. The local tap water is chlorinated and considered safe to drink. Alternatively, bottled water is available for purchase at restaurants, bars, hotels and local grocery stores. English is the official language, but islanders often speak a French-Creole patois or Kweyol similar to that heard on Martinique, Guadeloupe, Guyana, Grenada and Dominica. The currency in Saint Lucia is the Eastern Caribbean Dollar, (EC$). You can see the current exchange rate here. However, nearly all hotels, restaurants, and shops accept US dollars. Change may be given in EC Dollars. ATMs are available which dispense EC dollars and credit cards are widely accepted. Saint Lucia is on Atlantic Standard Time (AST) and does not observe Daylight Savings Time. Saint Lucia is 4 hours behind Greenwich Mean Time (-4 GMT). Saint Lucia is a sovereign island country in the Eastern Caribbean that is part of the Lesser Antilles. Saint Lucia is a mountainous island of 238 sq. miles, located about 25 miles north of St. Vincent and 25 miles south of Martinique and northwest of Barbados. The population of Saint Lucia is 185,868 (2016).